The perfect choice for all who seek relaxation and real fun! Hotel RIU Helios is situated on the beachfront of Sunny Beach. Located on the Black Sea coast, the resort offers everything you may need for an unforgettable holiday suitable for families, couples or just a group of friends. Sample local Bulgarian cuisine at the hotel’s buffet restaurant or our Theme restaurant. Our chefs will prepare delicious dishes combining the best products and tastes typical of Bulgaria. The All Inclusive system helps you to forget everyday stress and enjoy the comforts and services offered at the hotel. Two large swimming pools, a gym, table tennis, water ball, volleyball court and tennis court. In the immediate vicinity you can rent a bike, play mini golf and various water sports. Do not miss the daily adult entertainment program and the RIU Land Animation for Kids. At night, our entertainment shows and live music, as well as a wide range of bars, restaurants and clubs with the best music. 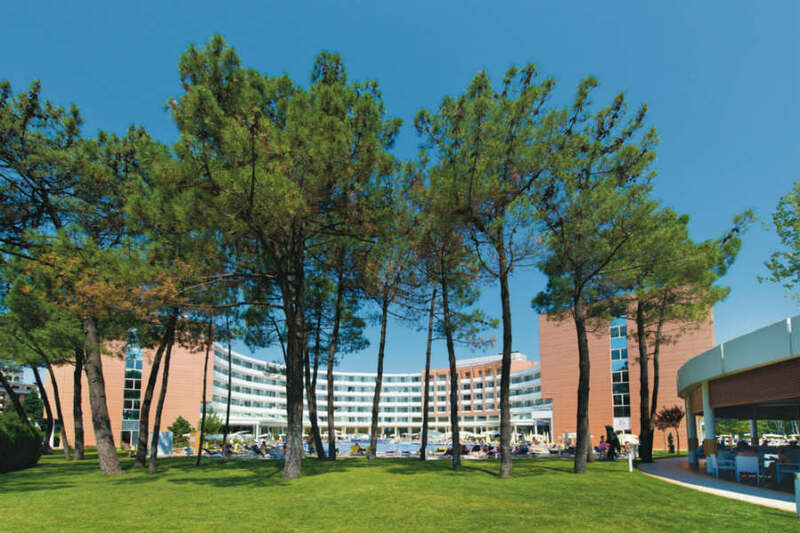 Sunny Beach has established itself as one of the most popular resorts in Bulgaria. The region boasts beautiful green forests and ancient colorful villages in the mountains. Do not miss out on walking around the small surrounding villages like Zheravna, Cape Emine and Nessebar. You can, of course, buy different souvenirs from Bulgaria, but undoubtedly the most beautiful memory will be that of your stay at RIU Helios Hotel. The hotel offers 395 rooms with modern décor including double rooms and suites.